As a longtime David Brin reader, I am very pleased to bring you a review of his latest novel, Existence, from regular “…on Anything, Really” reviewer, Andrew Robins. Existence is a big book in every sense of the word. It took David Brin more than ten years to write the 659 pages that deliver this powerful and compelling story. So the book is both physically big, and obviously important to the author. What makes this book ‘huge’ is the story itself, which is nothing less than (as advertised by the title), the story of existence. And not just the minor sideline that is the story of life on this backwater of a planet. 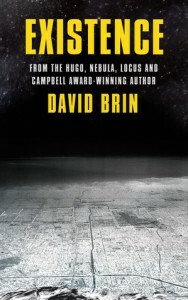 David Brin has delivered a hard science fiction novel that is truly galactic in the scope of its storytelling. These secondary plotlines are all interesting and well developed. They kept me engaged with the story for the first two thirds of the book. Right up until the author released a major “Aha!” moment — and I realised that the novel I thought I was reading was just the doorway into a much larger story. In the early 1980’s David Brin wrote a short story called “Lungfish”. When I read it, the story had a big enough impact on me that thirty years later, when I realised that I was reading a vastly expanded version (that both extends and subtly subverts the central themes), I had no problems remembering both the title of the story and how I felt when I read it. How much I wished there were more. Existence is very much that more. David Brin has taken the very stark message that sat at the heart of “Lungfish” and delivered a very human, and mostly hopeful, response. The story elements I describe above resonated with me. David Brin also supports these with a cast of very well-developed characters. For me, Tor Povlov is the story’s leading protagonist. She is a main point of view character who shapes events throughout the story. Tor Povlov faces major personal challenges as the story unfolds, but she never loses her agency and is never a victim. She is also not the only strong female character. She shares the stage with Lacey Donaldson-Sander and Mei Ling, who each have their own story to tell. Clearly David Brin does not go in for tokenism, and I really liked that aspect of the story. The major shift in focus in the last third of the book will lose some readers. (Especially readers that never read “Lungfish” and realised how much they had been wanting the rest of that story). Suddenly events on Earth seem pretty unimportant. (But are they?) I say to those readers – “just go with it”. Once you put aside your annoyance you will be very well rewarded. Loved it. Right up with previous Brin classics The Postman and Startide Rising for me. Three cheers for David Brin — and thank you, thank you, thank you for not letting go of this story. Readers who are unfamiliar with David Brin’s earlier work, but who like the works of William Gibson and Kim Stanley Robinson (particularly the excellent 2312), should like this book – a lot. This is a great piece of work. Well worth the wait. Although I love David Brin, both as a writer and as a kind, brilliant, human being with a deep soul, Existence did not quite work for me as a novel. It has an imbalance between plot, character, and idea. 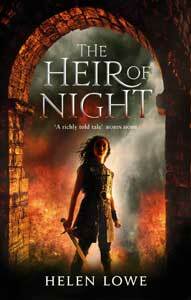 For novels that enthrall the reader, character is king. The reader cares about the character(s) and must keep reading to know what is going to happen to the character(s). Whodunit novels favor plot over character or idea. They are interesting and fun but not gripping. Existence is an Idea novel. Idea novels can work. Jorge Luis Borges was a master at it. Many of his works ignore character, and the idea drives the plot. Kafka wrote idea stories, but blended it some characterization. Several hard SF writers are strong on idea but still maintain strong characterization that drives the plot forward. These include Clarke, Niven, Vinge, and, usually, David Brin. If done with the proper balance, hard SF is fun to read, enthralling, and leaves the reader with a sense of awe or wonderment at the ideas. Existence did not balance characterization and ideas well at all. At the novel’s start, many of the ideas are in sans serif font and are an annoying interruption of the storyline. If the storyline were easy to follow that might be okay. But the storyline was hard to follow because it was developed through characters. As the reader begins to care about a character, that character disappears for many pages and another character is developed. This is done with the annoying idea interruptions in between. Then, as the reader gets well into the novel and comes to understand the relationships between the characters and appreciates the novel’s ideas, Existence jumps away from some characters for the sake of exploring the ideas. It becomes obvious that the characters are less relevant to the plot than the ideas. That is very frustrating for a reader. The ideas are interesting (Moderation: spoiler reference deleted). But the reader invests too much in the characters to throw them away for the ideas. So, in summary, Existence left me frustrated and annoyed at many points. It took forever to finish. There were many times when I wanted to put it down. But in the end, it was an interesting read. I’m glad I read it. But it could have been better. David Brin has written much better. I am a big David Brin fan and have just recently finished reading Existence. My experience places me between the original reviewer and the commentator. Like Shawn I found the first part of the story disjointed and a little difficult to dive into, however I truly loved the later part of the story when the book became more plot and character driven. It was well worth working through the first third of the book.